Beef cooked slowly in coconut milk and spices makes a rich and satisfying meal that is ideal for informal entertaining. Heat 1 tbsp of the oil in a large pan and cook the chopped onion for 3-4 minutes until softened. Stir in the curry and chilli powders, and cook for a further minute. Add the remaining oil, then the beef and stir to coat in the spices. Cook for 4-5 minutes, or until the meat is lightly browned. Stir in the coconut milk and stock. Cover and simmer for 1½ hours, stirring occasionally. Add the chickpeas, put the lid back on and simmer for a further 30 minutes or until the beef is tender. Stir in the spinach and cook for a further 2 minutes to warm through. Serve with organic basmati rice and a spoonful of organic low fat natural yogurt. allow the flavours to develop. Reheat thoroughly, adding the spinach just before serving. For a milder curry leave out the chilli powder. 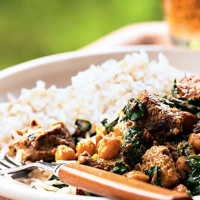 Serve this curry with light and refreshing organic ale.